Along with having all things book on the mind, we have been busy redecorating from top to bottom, inside, and outside. Jaime’s patio and Jacinda’s courtyard got a bit of a makeover, which sent us on the hunt for new outdoor rugs and mats to complete the space. We’ve rounded up some of our favorites that range from bright and bold, to subtle and natural. Are you redecorating your outdoor space this spring? We’d love to hear what has inspired you and don’t forget to share a peek with us on our Twitter, Facebook, and/or Pinterest page. 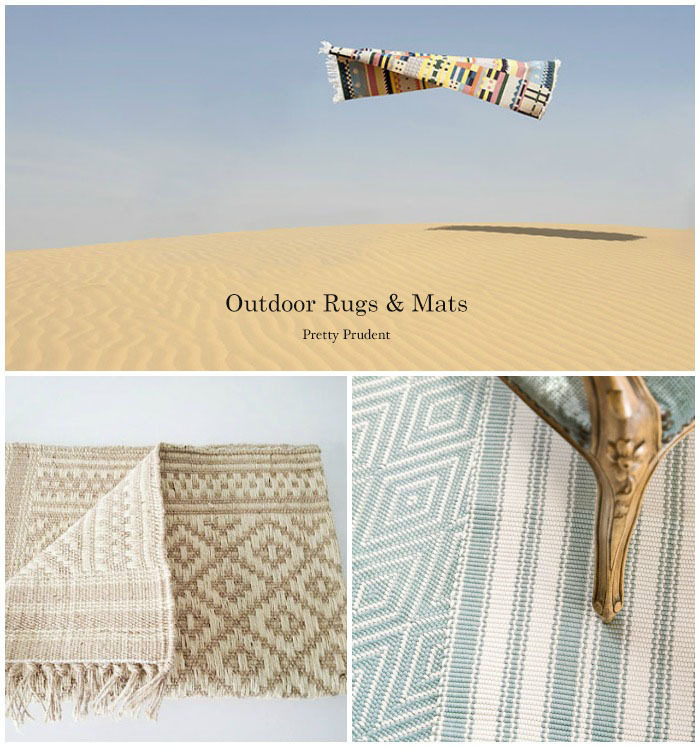 Bring a magical carpet out onto the patio with these Indian dhurries from Oyyo. Dainty Red Bird has a wide variety of stunning rugs, like the natural sand rug. Their Tangerine Bliss Rug would be lovely to bring indoors. Go for a light spring blue and ivory rug from Layla Grayce. Go nautical with the navy and ivory striped rugs from Layla Grayce this summer. 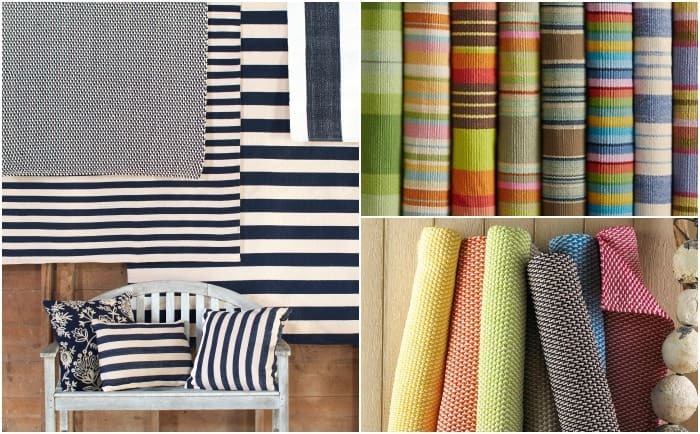 For a bohemian style, brighten up the patio with these colorful striped rugs from Garnet Hill. Instead of a pattern, focus more on a single color with the tweed rugs from Shades of Light. It’s easy to get lost in the wide variety of Dash and Albert rugs. There are several different styles and fabrics like these blue rugs. Mad Mats are a definite favorite of ours, since they are also environmentally responsible and are made with recycled plastic. Jaime has the Moroccan Indoor/Outdoor Floor Mat on her patio. The Navajo Indoor/Outdoor Floor Mat would be a great option too. The Crate and Barrel collection of outdoor rugs includes this bold, Diamond Indoor/Outdoor Rugs and subtle rugs with no prints. Wow i like all collection of design.Thanks to share this. Thanks for sharing amazing set of lovable rug designs will definitely have few of them soon….